•	18% of respondents saw an ROI of more than £70. •	Delivery rates, conversion rates, open and click-through rates all increased. •	Unsubscribe rates are largely unchanged compared to last year. •	More respondents use advanced techniques like using behavioural or lifestyle triggers compared to 2013, and they also report an increase in ROI from such campaigns. •	Respondents predict these trends will continue over 2015. Adam Williams, managing director of DBS Data said: “This survey highlights just how compelling the results can be, with 18% of respondents recording a return on investment of over £70 for every £1 spent. 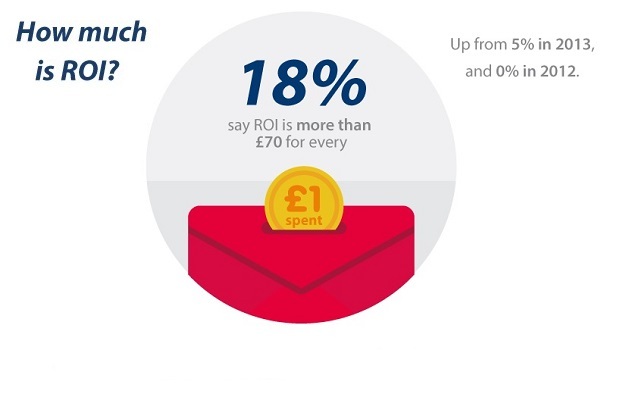 However, despite the returns, over half of all those polled are spending less than 10% of their marketing budget on email marketing, although spending looks set to increase for many in 2015. It would be interesting to find stats showing the ROI of companies after their adoption of marketing automation. I`ve been testing https://retargeting.biz/, a marketing automation software. So far the results look promising, but I’d like to know some results from other companies that have tested.